In case you missed our Facebook post from October 24th, I’ll repeat it here: “Please thank the New Milford Town Council and Mayor Gronbach for their continued support of the library. Last night, they voted unanimously to move forward with our plans for Modernization. Construction documents, here we come!! !” The three previous attempts to modernize the library have never made it this far, because, in case you are like me and didn’t know, ‘Construction Documents’ mean blueprints. Blueprints are the last step of planning needed before actually beginning building (aside from pesky things like funding, going out to bid, and town approvals such as zoning, building permits, etc.) I am sure this has progressed so far because the architects and the Modernization Committee have worked so hard to produce a plan that retains the original footprint and is thus a very financially conservative plan, but still manages to provide the desperately needed room for children, young adults, and more study space. If you haven’t taken a look at the story boards of the proposed plan in the library, please come in! The details have changed slightly since they were created, but if you have questions, I’d be happy to answer – just shoot me an email at stornow@biblio.org. 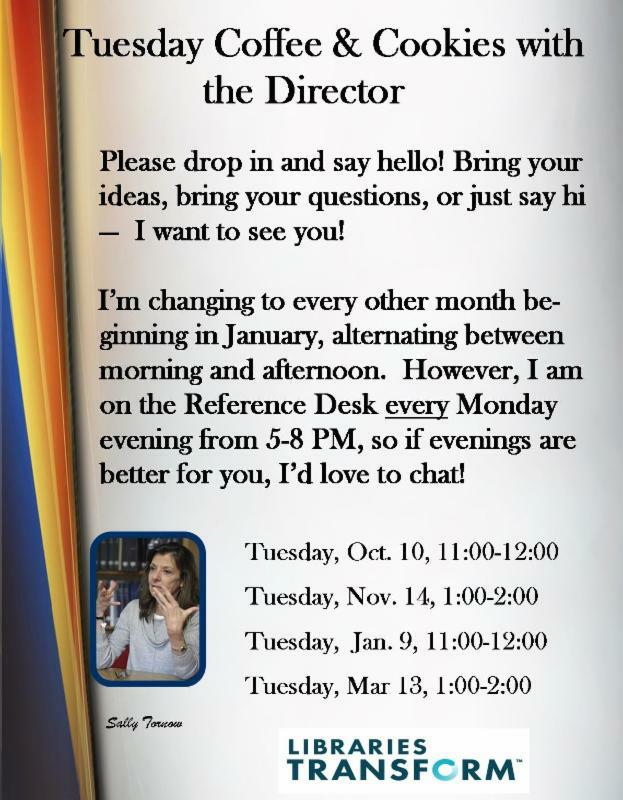 Or stop in and see me on Monday evenings at the Reference desk. Or stop in for coffee at my next Coffee With the Director on November 14th at 1:00 pm. 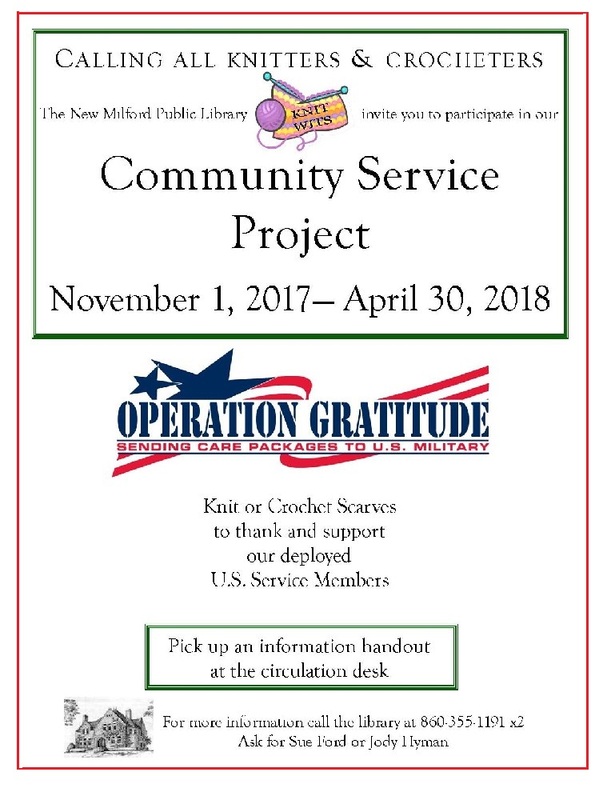 NMPL’s Knit Wits group invites you to join our Community Service Project: knit or crochet scarves to thank and support all of our deployed U.S. service members. Stop by the library to pick up an information packet. The project will run from November 1, 2017 through April 30, 2018. The scarves will be sent in several shipments over time, so please deliver your projects to the library as they are completed. 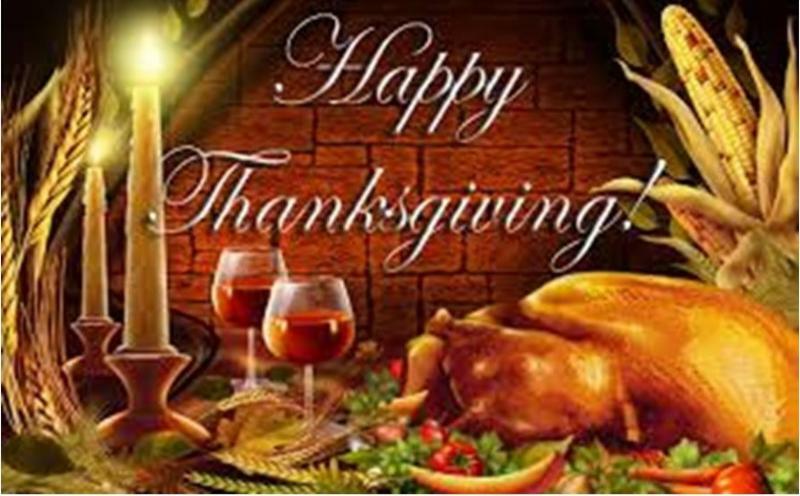 For more information, please contact Sue Ford or Jody Hyman at 860-355-1191 x2. A few years ago, you might remember that there was a story board of all the library employees and how each of their jobs contributed to how you receive the items you want. Many of you were amazed at how much goes into the purchase of one book. I think you will also be amazed at what goes into one book/CD/DVD arriving from another library. Many of you take advantage of placing holds on items that other libraries own, but I’m betting you never knew exactly what happens to make them arrive. So, Sally Tornow sees that the book she needs about modernizing libraries is not owned by New Milford, but several other libraries do have it in their collections. Fortunately, it is not a brand new book (no library sends new items), so she places a hold (request) online through My Account in the library catalog. Bibliomation, our consortium, uses an algorithm to choose which library will honor the request and puts it on that library’s Pull List within minutes. Each library has a Pull List of all the requests from both their own patrons and other libraries’ patrons. Depending on the staff or volunteers available in each library, those requests are pulled from the shelf anywhere from several times a day to once a week (New Milford pulls once a day because we have wonderful volunteers). Those items (at least 20 per day in New Milford) are then discharged by the staff member or volunteer, which activates the requests and tells the volunteer where to send the item. A wrapper is generated by the computer, the volunteer puts it around the item, securing it with rubber bands. It is then placed in a bin that is marked with a route number. All 162 public libraries, along with a few school and university libraries are divided into about 10 different routes. 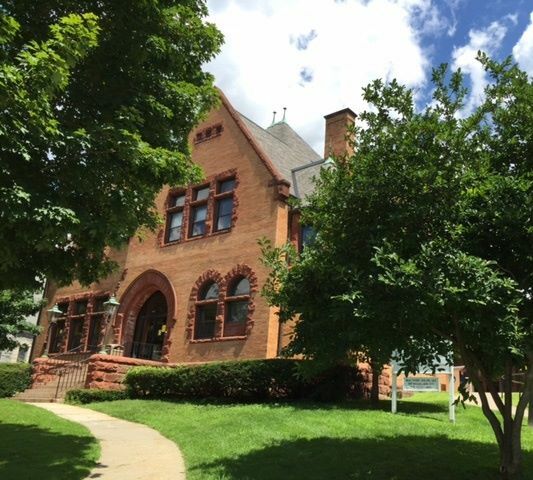 The State Library provides pickup and delivery of three bins per day (to New Milford – smaller libraries have to make do with 2 or 3 times per week). Each bin holds about 25 items. This is a reduction in what the service used to be and is why we have asked you to return books to other libraries if you took them out at that library – we simply don’t have the space to store those items and it takes away from those awaiting their requests. The bins are taken to a central location, where the drivers take all the bins for their own route. Within a week, Sally Tornow’s request arrives at New Milford in one of the three bins, a staff member whose job it is, discharges it, and Sally is notified by email that her request has arrived. This is best case scenario. If the library that owns the book can’t send it right away because their 3 bins have already been filled, or it’s a library who only pulls their requests once a week, or something totally unknown happens in the delivery route, the whole process could end up taking a couple of weeks. It’s a complicated process, but we are so lucky to have it – imagine if you had to actually go to all those libraries to find your items! 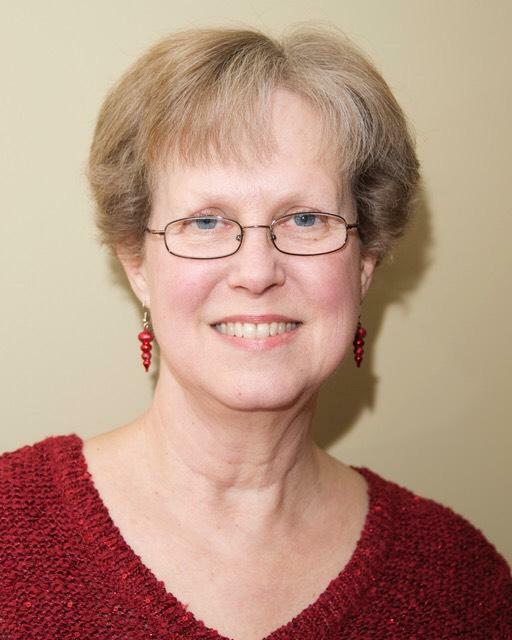 Christine Langerfeld is both a volunteer with the library and the Friends of the NMPL! Born and raised in Mamaroneck, NY, she is the youngest of five kids. She attended the College of New Rochelle and graduated with a BA in Psychology. Christine and her husband Rich moved to Montauk, NY, to start their life of 38 years together. The couple lived on Long Island for over 30 years, where they raised their daughter Erin. When Erin was in pre-school, Christine started as a page at the Montauk Library. She ended up staying there for the next 20 years, while Rich worked as a Marine Diesel Technician at a local yacht yard. Christine eventually became a librarian and then President on the Board of the Montauk Library’s Friends group for six years. She performed many of the same duties she does today at NMPL. Christine has so many funny stories from her days working at the Montauk Library that she could write a book! When Christine and her husband retired, they decided to move closer to their families in Mamaroneck. So Christine and Rich and their two rescue dogs, Reilly and Hannah, moved to New Milford five years ago. By coincidence (or not! ), Christine often found herself visiting the New Milford Public Library. She inquired about volunteering and has been doing so two mornings a week since. Sally asked if she would be interested in joining the Friend’s board and for the past three years, she has been volunteering with the Friends as well. She sorts donations, keeps the Book Cart filled, and is in charge of pricing the vintage books that are donated. As for recommendations for current books to read, Christine enjoys historical fiction and two of her favorite authors are Kate Morton and Anita Shreve. Christine’s philosophy of life is to try and do something to help others every day. The library is lucky to have the amazing Friends, and Christine’s expertise, helping us out!